Engineers and scientists alike will find this book to be an excellent introduction to the topic of porous materials, in particular the three main groups of porous materials: porous metals, porous ceramics, and polymer foams. 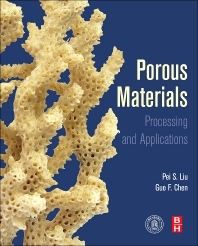 Beginning with a general introduction to porous materials, the next six chapters focus on the processing and applications of each of the three main materials groups. The book includes such new processes as gel-casting and freeze-drying for porous ceramics and self-propagating high temperature synthesis (SHS) for porous metals. The applications discussed are relevant to a wide number of fields and industries, including aerospace, energy, transportation, construction, electronics, biomedical and others. The book concludes with a chapter on characterization methods for some basic parameters of porous materials. Porous Materials: Processing and Applications is an excellent resource for academic and industrial researchers in porous materials, as well as for upper-level undergraduate and graduate students in materials science and engineering, physics, chemistry, mechanics, metallurgy, and related specialties. P.S. Liu is a professor in the College of Nuclear Science and Technology at Beijing Normal University (BNU), Beijing, China. He graduated at Chinese Academy of Science in 1998, and received his doctor's degree in materials science and engineering. He has ever served as the committeeman of the academic committee of the Key Laboratory of Beam Technology and Material Modification of Ministry of Education of China, and the first director of Material Physics Division and then the vice director of Nuclear Physics Research Institute at BNU. Investigating on porous materials and high-temperature coatings for quite a number of years, he has published extensively in the area of materials science and engineering as the first author, including about 60 SCI papers, more than 40 EI articles, and 6 academic books. In addition, he holds 8 Chinese invention patents as the first originator. Dr. G. F. Chen, Ph.D. from the Institute of Metal Research, Chinese Academy of Sciences; Alexander von Humboldt Fellow in the Max Planck-Institute of Metals Research in Germany; research scientist at the Au4 National Physical Laboratory in London; research specialist at Cleveland State University in Cleveland, Ohio, professor at the Northwestern Polytechnic University in Fremont, California, and now an expert in corporate technology at Siemens Ltd., in Beijing. He has more than 20 years of experience in materials research and development, particularly with energy materials.